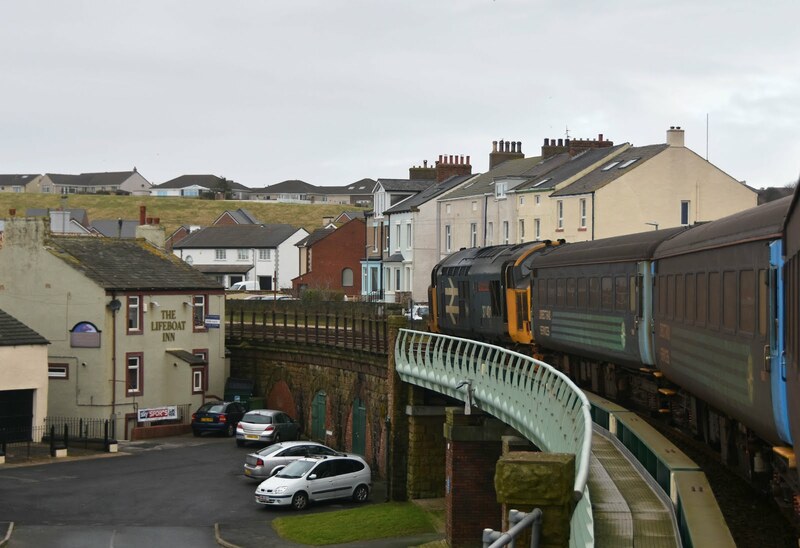 37401 pauses at Whitehaven for the token exchange. With the news that full class 37 operation may soon be giving way to class 68's on the Cumbrian Coast I found myself on the Sunday night Caledonian Sleeper on 21st January heading up to Carlisle. The sleep wasn't too bad but there was still no getting away from the fact that an 04:30 wake-up call is early! 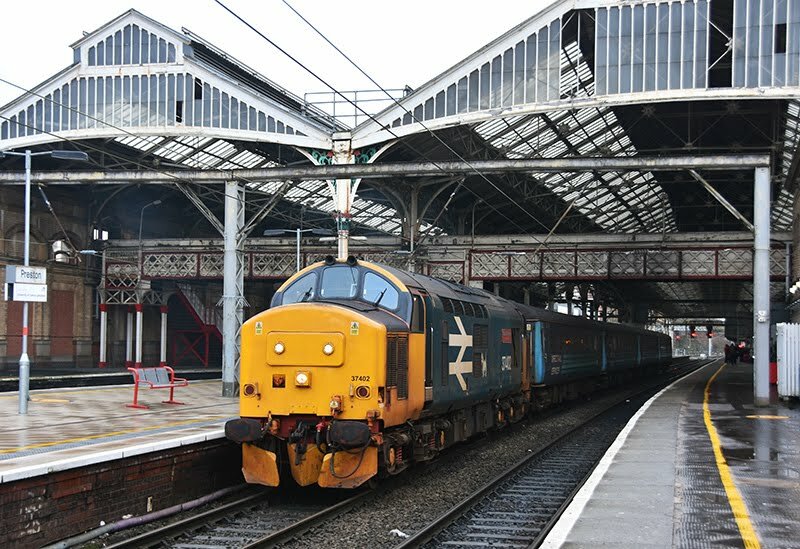 At 04:45 the London - Glasgow/Edinburgh overnight snaked out of Carlisle into the night and all that remained was to wait for the class 37 to arrive for the 05:15 Northern service to Preston via Barrow-in-Furness. Several locomotives were on Carlisle Kingmoor which could have turned up for the train but ultimately I was very pleased to see 37402- the one I had been hoping for- on the rear of the train as it growled into the station. I had first seen 37402 back in 2005 when it was stored at Bescot- A loco I had missed and never expected to see running again. 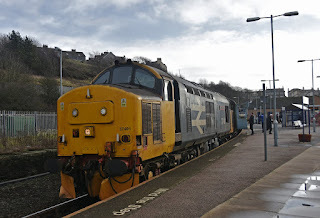 When 37402 returned to service with DRS in 2013 it was certainly a pleasant surprise- yet it had eluded me on passenger workings since (I really should have come to Cumbria more!) and was now considered a very threatened loco with high engine hours. The 'large logo' 37 did not disappoint taking me the 156 miles to Preston via the coast- sadly all in darkness at this time of year. If not for the scenery watching the various flows of commuters proved interesting - workers for Sellafield, school traffic for Barrow and then Ulverston and finally workers heading into Preston. The 05:15 from Carlisle is a heavily loaded train for many sections of it's journey! The other locomotive out on the coast was 37401 which had berthed at Barrow-in-Furness overnight. The result was a great pairing of the first two class 37/4's working together in BR Large Logo blue in 2018! Things are soon due to change with class 68's expected to take over one of the diagrams from late January. 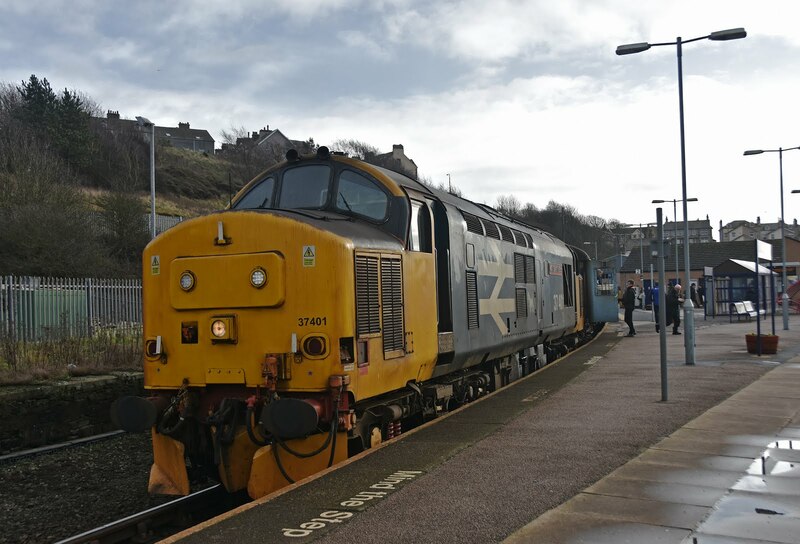 37's are likely to continue in some form for a few more months but issues with reliability of both the locos and the Mk2 DBSO's have caused poor performance on the route and alternative options are therefore being explored. Once again I am reminded that this is a beautiful line and I really must make the effort to get back here once the weather improves!